An Inter-Ministerial Central Team (IMCT) that arrived here today called on Chief Minister Pema Khandu at his offices here this evening. The central team headed by Joint Secretary, Union Ministry of Home Affairs, V Shashank Shekhar arrived in the state capital today on a four-day visit to assess the damages caused by natural calamities like flood, cloud burst, landslides, etc in the year 2016. The central team consists of Vishal Pandey, Asst Executive Engineer, Ministry of Road Transport and Highways, Jintu Das, Jt Director, Jute Development, Swapan Roy, Jt Director, Regional Power Survey, Ministry of Power, Subhash Chandra Meena, Jt Director, FCD, Ministry of Finance, P M Scott, Chief Engineer, B & BBO, Ministry of Water Resources and GR Zargar, Senior Consultant, Ministry of Drinking Water & Sanitation besides Shashank Shekhar. The Chief Minister welcomed the team members many of whom were first-time visitors to the state and explained in detail the recurring losses caused to the state due to unpredictable climatic conditions and rough terrains. He reiterated that in terms of disasters caused by nature, the state faces an uphill task and relief and rehabilitation process besides restoring the losses and disrupted services. Khandu called for viewing Arunachal Pradesh from a different perspective while drafting a report on the losses faced by the state, which unfortunately has become a yearly phenomenon. “Every year we face the same situation. Every year we lose precious lives. Every year the losses caused in infrastructures like roads, houses, water supply and power lines, bridges, agricultural land and crops, livestock, etc are huge,” he informed. 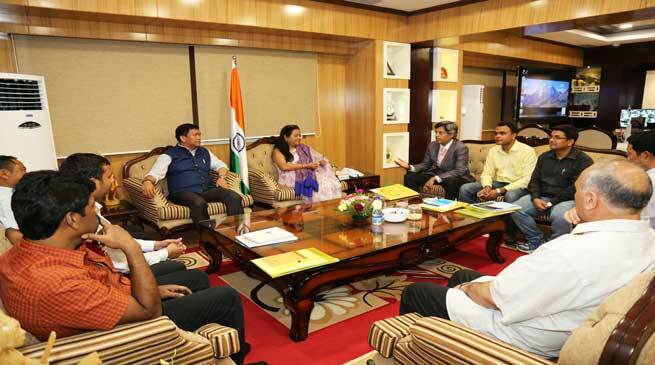 Khandu also requested the central team to give more emphasis on agriculture sector as majority of the people are marginal and poor farmers, who face huge loss during the monsoons. The Central Team admitted the challenges faced by the state in terms of coping with natural calamities and providing relief and rehabilitation to affected people. The members assured the Chief Minister that they will work out with concerned departments and find out ways and means to offer the best possible assistance to the state government. The central team are slated to visit places like Namsai, Pasighat, Mebo, Dambuk, Bordumsa, Tawang and other affected places of the state if and as the weather permits. Chief Secretary Shakuntala D Gamlin, Secretary Disaster Management J Angu and Director Disaster Management Y W Ringu were also present during the call on. Earlier, the central team held a detail meeting with concerned departments like PHED, PWD, RWD, Health, Agriculture, Hydropower, APEDA, WRD, etc, wherein the departmental officials made powerpoint presentations on the damages caused and loss incurred last year.